The Engagement - your friend is getting married...now what? I've gotten mixed messages when it comes to vort gifts. If you are one of her close friends, then you should get her something. I have had situations where I am close friends with the close friends of the Kallah and they ask me to participate in the vort gift. It's really up to you. If you want to participate you can, no one will tell you not to give :-). 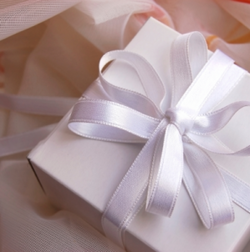 Keep in mind that an engagement party gift is not supposed to be extremely expensive. Something cute and useful goes a long way. If you want to spend money save it for the shower or the wedding. Group of friends: If you have a group of friends then everyone can chip in a set amount (you decide that but normally it's anywhere from $10 - $20) and then delegate the job of buying something to one girl. The easiest thing is to use a home goods store and make up a package. I have seen stunning dishes and serving plates, but if you know her well enough you can get something personalized. Towels, bentchers, whatever you think of. The stores I know of that are great to use are Smoke and Mirrors or Kitchen Clique and it is one of the easiest ways because people can simply call up with their credit card numbers and you don't have to run after the whole world collecting money. You'll have to do that for the shower, so spare yourself the trouble if you can. But if you don't choose to use them, you can go to any place that sells house goods. **added bonus: if you go to Smoke and Mirrors and tell them you heard about them here you get a 10% discount!! **married friends: If you have married friends in the group feel free to bug them to chip in--they need to give a gift too!! A few friends: Now if you and just a few friends want to get something, I've done this too, I recommend going to the store first and seeing what's available. You are much more limited with only a few friends and it might be easier to find the item first and then divide the amount. Otherwise you can simply chip in together and go buy something that is in the budget. Just you: If you are buying a gift by yourself you have to be really savvy. It is hard to find something that is engagement worthy yet still affordable. I would recommend starting early and going to big department stores. The presentation will not be anywhere near the small boutiques in Flatbush, but it will be more affordable.